…thank you for taking the time to refurbish your hotel recently. Although, having not seen the original state of the place, I can’t comment on how much of an improvement it is, I can comment on how voluminous the room was and how grand the entire building was. Good job. More importantly I would like to tell you about your food. We ate in the Hourglass Bar on the night of our arrival, and despite the ineffectual and irrelevant quotes about hourglasses on the menu, the food was top-notch. 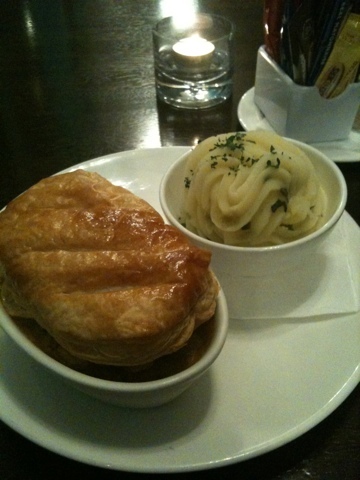 I had the ‘Pie of the Day’ which came with mash potato, one of the cheapest things on the menu at €5. Awesome value for an awesome meal. The next night we had room service, something which I have never done before mainly because in principle it seems totally ridiculous. However, it seemed like a good idea at the time and still does now, so it was a good idea. Looking back, the €5 tray charge could have got me another pie but I was so stuffed after the lasagna that I wouldn’t have wanted it. Breakfast. Included in the room rate. 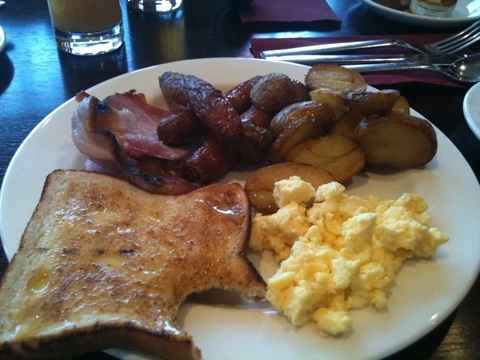 Huge choice of food, I was hugely satisfied after each morning, and I’m hugely fat now. Definitely beats the bowl of Frosties I seem to keep eating in the morning. No more needs to be said. The rest of the hotel is just as good as it’s food. The only slight irritation is that it takes 45 minutes to get into Dublin city centre by the bus which runs from the hotels doorstep. Not a huge problem, and not the hotels fault really. Finally, I would like to apologise for the lack of intriguing and thought provoking posts of late. In fact, this has probably been a problem throughout the process. I’m now back home and back to the working routine after a great weekend away in Dublin, eating Guinness seeds. Yesterday I broke down on the way home from work which ate (great pun for a food blog) in to my time for yesterdays post, resulting in this low calorie content post. Yesterday, I caught up with some of the Peoples Supermarket and it is likely I will also write something about that soon. All my weekend posts are now fully updated food wise, and it is now apparant just how much I have eaten! Last Wednesday I got man of the match in Turbo GTF’s greatest win ever, tomorrow I will not. I seriously doubt that after a week of eating on this scale I will be able to walk for 40 minutes, let alone run and kick. 12:40- Flapjack and a sandwich containing tomato and something else. 18:00- Spag bol. with cheese.